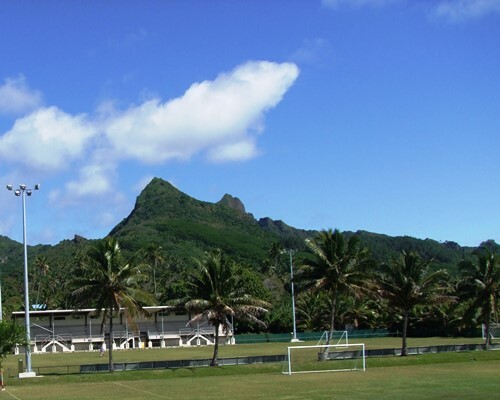 The floodlights at the Cook Islands Football Association (CIFA) Complex were installed together with renewable solar energy late last year and was fully completed earlier this year. The total project cost was covered by FIFA, under the Member Association Less Privileged Program (MALP). The solar panels renewable energy system was installed by Horn and Bird and construction of the power polls and the floodlights were installed by John Koteka Electrical. Although the lights has been briefly tested a few weeks ago, it will be put through its first and hopefully full and successful test tomorrow evening when the 2014 Knock Out Winners Takuvaine Red Devils take on the Round Cup Champions Tupapa Maraerenga at the CIFA Complex in the Charity shield match as the season opener for the 2015 Football season. All proceeds from the match will go to a Charitable Organization to be confirmed by CIFA tomorrow. The fee to enter through the gates is a minimum of $2 and anyone can contribute more or any amount if they wish for this worthy cause. Come on down to the CIFA Complex for some fun and exciting football by the two Premier Men’s teams Takuvaine Red Devils and Tupapa Maraerenga. Before the main match tomorrow, there will be curtain raiser matches in the Under 8 Mixed Division at 4:30pm followed by the Under 11 Mixed Division at 5:00pm.